It's KCFW casting time once again...! If you are considering trying out for Kansas City Fashion Week (or any runway casting, really), this post is for you! KC Fashion Week has been a great experience for me. I've met many friends, colleagues and connections that I otherwise would never have had the pleasure of getting to know. KCFW is an environment that fosters growth and confidence for all types of models. If you've ever thought in the back of your mind, "Oh, modeling would be fun to try...," then now is your chance! Castings are being held June 2 and June 10 (more info HERE). The time to start prepping is now! Read on for my tips on getting runway-ready for a successful audition. Treadmill + Heels = CONFIDENCE! The above heading horrified me even as I typed it out. Treadmills are the uncoordinated's (me) nightmare, and add heels to that and it is a precarious match. HOWEVER, this is something I did to get comfortable in my heels for auditioning. Once I decided which shoes I would be auditioning in, I slapped them on, fired up the treadmill and walked for fifteen-ish minutes every night until those heels felt like a second skin to walk in. If you don't own a treadmill and don't want to look very "extra" at the gym, wear the heels around the house whenever you're home! Switch off Netflix for a bit and spend some time researching models' walks on YouTube. Look at how the models' hips are moving, look at how their shoulders and head are NOT moving as much. Are models crossing their feet to walk in a straight line or is it more relaxed? Another great piece to look out for is arm movement. Once you find some videos you like, watch them several times so you can analyze all the different aspects. Everyone will identify or like a different models' style more, but I like to watch Cara Delevigne or Gigi Hadid. Do it in the Mirror. As the rap songs suggest, using a mirror to look at yourself can be a great tool for perfecting your walk. You've gotten comfortable in your shoes, you've watched YouTube videos to see how the pros do it, now it's time to put your own body in action! I like to drag my full-length mirror out of my bathroom and put it in my big, open living room so I have plenty of room to practice and see the full walk. Remember, you will develop your own style of walk so it's ok if you don't look exactly like Cara or Kendall, but the mirror allows you to watch for those elements you want to incorporate. Once you have a visual/physical corollary it will be easier for your body to remember and "see" in the mind what you are doing when you get in front of the judges for audition! It can be anyone--your best friend, boyfriend, mom, dad--but at some point prior to casting, it's a must to have a new set of eyes on your walk. If you're lucky (and your bf or dad is very patient) they should take the time to watch a runway video on YouTube. Even if they don't have any knowledge of what it takes to walk a runway, the main point of them watching you walk is to practice having an audience. You do NOT want the first time you walk in front of anyone to be when you're strutting toward the casting judges. Things get different when you have eyes (no matter how many pairs) on you. Once you've got your walk down, add in a spectator or two. Drink a LOT (of water). This is always a good idea whether you are casting or not, but in the weeks leading up to casting, pounding the H2O is a must. It may not seem like a big deal or even related to a great walk, but trust me. You will feel refreshed and full of energy, which translates into confidence and spark in your walk. More importantly, your skin will have a fresh glow. Castings are minimal/no makeup, so it's important for your skin to look at the top of its game. Go beyond the walk // Click for even more of my Kansas City Fashion Week audition tips! GOOD LUCK to everyone trying out! Remember confidence is the most important piece of a successful casting--I hope my tips can help you achieve that confidence! Kansas City Fashion Week Autumn/Winter 2018 | My Modeling AND Media Blogging Experience! It's crazy to think it was just one year ago that I did my first Kansas City Fashion Week (or KCFW from here on out)! Coming into this season of KCFW, I really felt comfortable and at home around everyone and in the venue--even more so than seasons before. Overall, this season felt really relaxed with less stress, pressure and nervousness for the shows. One reason for this is that I split my fashion week time between modeling and doing media/blogging. I covered media Wednesday and Thursday nights, then walked the runway Friday and Saturday! Keep on reading for more details and photos of my KCFW experience. The most important part of any story is arguably the setting; KCFW action was set at The Grand Hall at Power & Light in downtown Kansas City. While this venue is smaller than the traditional Union Station venue, the beautiful architecture, upper mezzanine views (seen above) and unique "European Style" runway are always a cool experience. I've always thought this event space (available for rent) would be a great option for a Kansas City wedding reception! While not the most "glam" event on the KCFW schedule (no red carpet here, guys! ), the media meet & greet is one of my favorite events of the week. I find myself interacting more frequently with folks on the models/designers end of the fashion spectrum, and it is always really nice to switch gears and mingle with some bloggers and influencers. The media event always allows for that! This year we had a private shopping event at Kindred boutique, accompanied by mimosas (yay!) from Cooper's Hawk Winery and treats from Dolce Bakery! Photos above are by Larry Levenson. Thanks for the great shot of my twin Pam (@sideofglam) and I! Wednesday night of KCFW--kick off night!! The first night of shows always has a unique energy. Everyone is excited to get the week underway, many of the designers showing the first night are new and hungry to launch their collections, and there is a sense of entropy as everyone rushes to pull it together for the first night. Prior to this season, I had only experienced Wednesday nights as a model. Attending the shows as media was very different, yet still held many of the same vibes for reasons described above. The night started off getting ready with fellow media pass holders + friends, Pam (@sideofglam) and Kelly (@fashionbyfreeman). Pam and I inadvertently wore the same outfit concept with the monotone outfits with a pop of fur--fur being practical since it was cold and rainy weather! This was the first time going out with my new dark hair. It took awhile to get used to it so I was still in an awkward state of emotion! I wore a strapless jumpsuit by Planet Blue (similar), faux fur by LPA (which is BACK IN STOCK !! ), heels by Marc Jacobs and carried Saint Laurent. While all the collections were incredible, Schyline stood out for me the most. With flowing garments in shades of ivory and navy, I wanted to reach out and touch each piece as it glided past. Anyone who knows me knows I love something both visually and tactilely pleasing and Schyline definitely hit the mark on this with gorgeous pieces that were obviously high on wearability and comfort. Thursday was another fabulous night of fashion and friends. Thursday KCFW vibes are always kind of laid back; we are all in the flow, and it's the calm before the storm of the weekend rush. I find it so fascinating how each night of KCFW has its own personality and feel. I loved pushing the boundaries with Thursday's outfit. I'm a huge proponent of stalking more expensive pieces until they go on super sale (if you're that committed, it's worth a buy!). This set by Fleur du Mal is an example of me practicing what I preach--I watched it for over a year until it became affordable! I was a little hesitant to wear the matching bralette as a top, but with the leather jacket it was perfect! KCFW is a great place to push fashion boundaries and try wearing things out of your comfort zone. The jacket is my favorite piece of all time by Cabin + Cove, long necklace by Georgina Herrera, shoes by RAYE (on mega sale + my go-to heel), and I carried the Alexander Wang Diego bag in leopard (I FOUND one for sale--and they sold out everywhere!). I was already enjoying the chill Thursday vibes and having a great time at KCFW, but when House of Pamela Renee's signature runway song began to play, a huge smile broke out on my face. 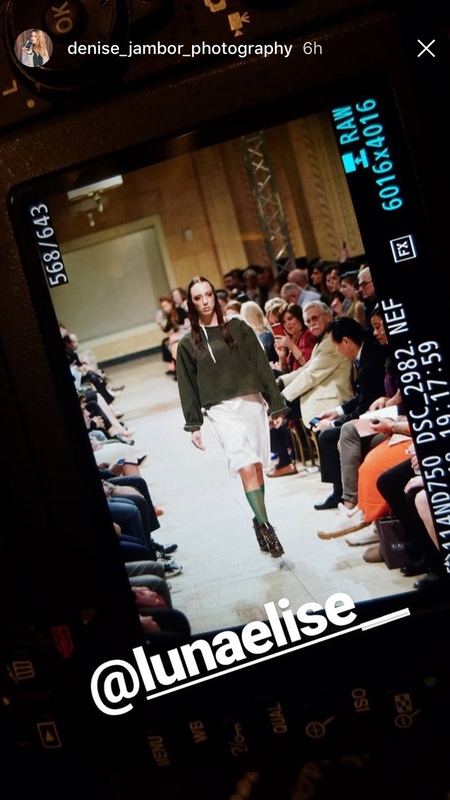 Not only did the song bring back great memories of walking for Pamela last season at Union Station, but I knew I was about to see some impeccably crafted designs. To say I was not disappointed was an understatement. The warm tones, vintage inspired prints and rich textures were speaking to me in a big way! House of Pamela Renee always incorporates designs for both men and women in her collections; being a huge fan of menswear on women, I could see myself wearing styles from both the mens and womenswear pieces (like the coat above!). Friday signaled the shift in my KCFW experience from media mode to model mode! Munelle de Vie was the amazing designer (and friend!) I walked for on Friday. 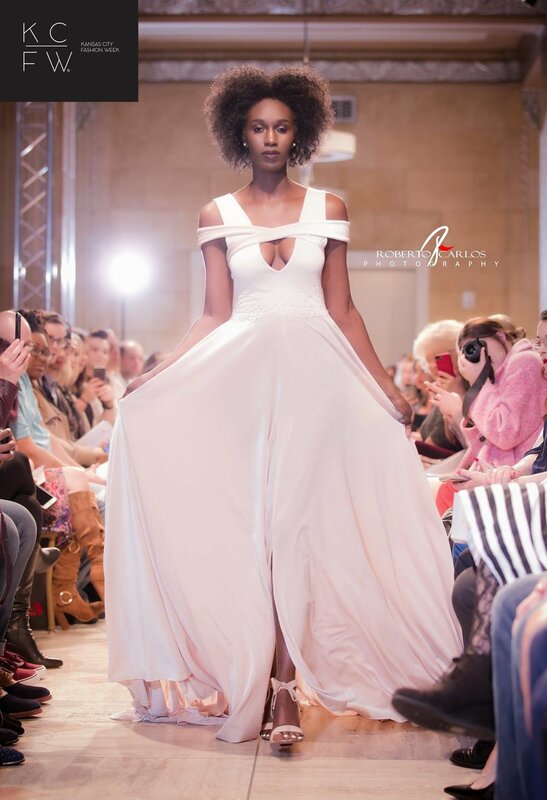 Munisa, the beautiful woman behind Munelle de Vie, had a killer vision for the runway. Our makeup was very glowy and fresh while our hair was more of a grunge style, which perfectly complimented her femme-street collection. I always enjoy when designers go the extra mile with styling and unique beauty looks. During the runway, Munisa encouraged us all to walk as if we were "walking the city streets with our headphones on." For me, this was yet another layer of direction to perfectly set the mood. With all these elements coming together perfectly, I was not even nervous when I hit the runway, which surely helped embody the laid-back yet statement streetwear line. Thanks for having me as part of your Munelle de Vie team, Munisa! SHOP ALL MUNELLE DE VIE HERE (you know I will be)! Whether you are an audience member, model, designer or staff member, finale night of KCFW is always exciting and glamorous. However, this year was even more thrilling for Georgina Herrera's team as we were the finale designer on the finale night! To live up to the hype, Georgina developed a complex choreographed runway complete with never-before-seen on the KCFW runway, box risers for the models. This created an interactive runway/gallery experience for the audience--and also a lot of panic amongst the models who had to climb the boxes in heels! Putting my mountain-climbing skills to work, I took my place on and off the boxes, walking to a constant chant of expletives running through my mind, all the while I managed to maintain the high level of slay that Georgina's collection requires. It will not surprise the reader that I--and the rest of the team--breathed a huge collective sigh of relief and triumph once we completed the runway and wowed the crowd! We all deserved a beverage after killing that runway...lucky for us, it was KCFW After Party night! In keeping with the spirit of KCFW, my velvety after party look included pieces from some of my favorite Kansas City designers! The emerald jumpsuit by Andrea Marie Long Designs is from the KCFW A/W17 runway, gold earrings are by KC's own Janesko, shoes are by Raye, and I'm carrying Luana Italy. The bracelet is vintage, but sourced right in KC at River Market Antiques! Thanks Kansas City Fashion Week for another great season! If you want to be part of KCFW next season (as a designer, model, spectator, volunteer, etc), like the KCFW Facebook Page and keep an eye out for castings and tickets! It's crazy to think that one year ago, I didn't know Kansas City had a fashion week. Times have changed and I had so much fun getting to experience the epic production that is Kansas City Fashion Week both as a model and as media for Luna Elise. This will be a long post, but if you're in the same boat I was last year and don't know much (or anything) about Kansas City Fashion Week, definitely read on to learn all about the hard work, fun and talent that goes into making this event possible. The week got started in the best fashion possible--shopping, champagne and sweet treats. The Kendra Scott boutique in Leawood hosted us, and Dolce Bakery provided delicious food. A proceed of all sales went to the Kansas City Fashion Council (giving us an excuse to shop). The best part of the event was getting to meet and chat with KCFW staff, photographers and fellow bloggers who we would be seeing all week. I'm pictured above with fellow fashion blogger, Bella Lightner. Check out her blog here. Another night of getting spoiled with sips, snacks and swag. This event was held at the downtown KC Fortuity warehouse (the one with the insta-famous "Kansas City I'm So In Love" wall). While the swag bags from Dior Beauty and Lee Jeans were amazing, the best part of the evening was meeting fellow bloggers in the KC area. The wine by KC Wineworks was great too--I'll definitely be checking out their new downtown winery soon! I had been looking forward to this black tie event ever since I modeled for the promo shoot (yes, that was my hand in all those ads, haha!). Invite a large group of fashionable people to a black tie event and the styles are going to be incredible. I loved seeing all the amazing gowns and interacting with designers. This was the most-attended event so far, so it was fun mixing with everyone before the following runway show days. After successive nights of parties, the real show started on Wednesday. I shifted into model mode with an appearance on KC Live with designer TR Brown, then rushed to the Power and Light Building for my noon call time with Coco & Illia. I would be lying if I said the day wasn't long, but it was well worth the preparation time. Bellus Academy took charge and made sure every detail of our hair and makeup was perfect (special thanks to Miss Jessica!). Coco & Illia are a duo of designers fresh from Stephens College, and their designs brought an edgy yet playful street style to the runway. Red sequins, purple satin, dramatic lace-up pieces and mesh looks dominated the Wednesday night runway. The debut collection, Blackout, will be available for pre-order soon, so make sure to follow Coco & Illia so you don't miss out! As for my experience--I was glad to get my first runway under my belt as I was a little nervous! Wednesday left me confident and ready to take on the rest of the week. While Thursday was technically a "rest" day for me since I didn't have a runway show to walk in, I started the day with an early hair and makeup call time for a TV spot with Georgina Herrera. Fellow model Tmara Hepburn and I modeled Georgina's jewelry on Univision--a Spanish-speaking channel! This was followed by a much-needed nap, an even more needed happy hour sushi date with my friends, and then it was back to the Grand Hall to watch the Thursday night shows! Highlights of the night for me were Roger Figueroa, Amanda Casarez, and Madyssen Jean Designs. Roger Figueroa's models seemed to glide down the runway to slow electronica in edgy, androgynous designs and Lady Gaga-inspired jewelry. Amanda Casarez spun her very wearable pieces into an eclectic mix of knits, oriental inspired up-dos and gilded makeup. Madyssen Jean Designs showed a line of boudoir inspired pieces embellished with wistful love quotes, engendering a dark romance in the collection. Celebrating its 100th anniversary, Lee Jeans injected energy into the set as models showed the newest range. I absolutely loved attending KCFW as media, and seeing how other models handled the runway made me even more prepared for the following days. Friday's procedure was almost the same as Wednesday's--noon call time at the Grand Hall. Hair and makeup were underway, again by Bellus Academy. Tiffany Brown, of TRBrown Designs, was presenting a collection of 70s inspired clothing, so our hair was teased to the heights and mod makeup was applied with upper and lower dramatic lashes creating a Twiggy-esque effect. We had some fun during the afternoon shooting our full looks around the Grand Hall with KCFW photographer, Eli Stack. With the complex hair and makeup and the shoot, before we knew it, it was showtime. I had the privilege of opening the show for Tiffany. The crowd response to her collection of rich colors, deep furs and upholstery fabrics was phenomenal. It was the biggest response a runway show got all week! It was surreal to walk with people cheering and commenting on all sides--and keep a straight face. I was so proud of Tiffany and can't wait to see where TRBrown goes in the future! "Ohhh, you're walking for Georgina?? Congrats, we love her!" Was the response I unanimously got when I told people who I was walking for this season. Their response was appropriate. Georgina Herrera, of MCK brands, is one of the most beautiful people I know, inside and out. Plus, she is also extremely talented and knows how to put on a show. Her collection of big, bold jewelry stood out perfectly against simple black and white dresses. The runway set-up (although giving us some trouble in rehearsal!) was perfect to showcase the jewelry. The models had several stops, turns and poses along the runway, so all of the audience had the best chance to see the detailed accessories. Walking for Georgina was a perfect way to top off my KCFW experience! Check out her collection here! An enormous thank you goes out to the KCFW staff! I can't say it enough, so thankful to be a part of this great experience! To learn more about Kansas City Fashion Week and for updates on future model castings and tickets, visit their website and like the KCFW Facebook page.